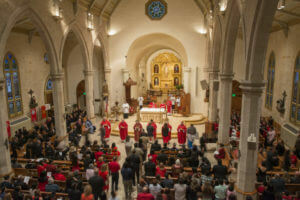 \ \On Oct. 6, the San Antonio legal community will come together at San Fernando Cathedral, 115 Main Plaza, to take part in a centuries-old tradition celebrating the beginning of the judicial season: Red Mass. The Most Rev. Gustavo García-Siller, M.Sp.S., Archbishop of San Antonio, will be the principal celebrant and homilist. The Hon. Sandee Bryan Marion, Chief Justice of the Texas Fourth Court of Appeals, will offer welcome remarks. At 5:45 p.m., judges and legal organizations will have a procession carrying bright red banners through Main Plaza to the Cathedral. The Mass will begin at 6 p.m. and is open to the public. The St. Mary’s University School of Law and the Catholic Lawyers’ Guild of San Antonio revived the tradition 64 years ago and organize the annual event with representatives from San Antonio legal organizations, the judiciary and the State Legislature.